In the seasonally dry hills of central India, shade is a welcome reprieve for the millions of villagers and animals coexisting along roadsides, seeking the cooling presence of the Chinaberry’s cousin, the Azadirachta indica. These large evergreen trees commonly known as neem grow as high as thirty meters tall, and are revered not only for their shade. For villagers all over India, where it is referred to as the ‘village pharmacy,’ neem is nothing short of a miracle plant. The term ‘village pharmacy’ evokes a certain memory even in me, taking me back to my childhood, and into my mother’s kitchen, the air filled with the aromas of India’s many spices. I recall my mother in her beautiful sari, grinding the tiny, tender neem leaves in her mortar and pestle, then gently applying the bitter concoction on my skin, itching with chicken pox – all along never questioning her elemental wisdom. Of all the plants that are valuable for humanity, the astonishing versatility and hardiness of this evergreen tree indeed holds a distinction of its own, having faithfully served the Indian people for centuries. Every part of this sacred tree is used in some form on a daily basis: the twigs as a toothbrush, the oil for soap, and the leaves as a medicine to treat skin lesions, as well as to keep insects away. Neem’s role as a miracle plant is traced as far back as 4,500 years ago. The earliest documentation of the tree mentioned its fruit, seeds, oil, leaves, roots and bark for their extraordinary medicinal properties. These benefits are thoroughly listed in the ancient documents Caraka Samhita and Susruta Samhita, the books which form the foundation of the Indian system of natural healing, Ayurveda. Ayurvedic literature extols neem’s genuine effectiveness for many different reasons. Not only is neem one of the most powerful natural blood-purifiers and detoxifiers, it also cools fever and clears the toxins involved in most inflammatory skin diseases. Ancient Ayurvedic practitioners believed that skin diseases could be caused by high sugar levels in the body, and neem’s bitter quality was said to counteract the sweetness. According to Ayurveda, neem is also antipyretic (fever-reducing), alterative (producing a gradual and beneficial change in the body), anthelmintic (dispelling parasites), antiseptic (destroying bacteria), and bitter tonic (strengthening the organism). Unlike the exotic, pleasure-inducing, sweet smelling fragrances of many essential oils, extracts of neem oil do not evoke the same sensory awakening that many of us have come to experience with aromatherapy oils. But the old adage, “never judge a book by its cover” aptly applies to the properties of this wonder plant, whose superior benefits have been only recently noticed in the United States. With the current resurgence in plant-based health and beauty products, neem leaf extracts and oils from the seed kernel are being rediscovered for beautiful and healthy skin. Neem’s effect on the skin is indeed the most coveted property of this plant. The leaves or oils of the tree are specially prepared and act as general antiseptics, while its antibacterial properties make it effective in fighting most epidermal dysfunctions such as acne, psoriasis and eczema. When used in aromatherapy, neem oil simultaneously moisturizes and protects the skin, healing it from any irritations. 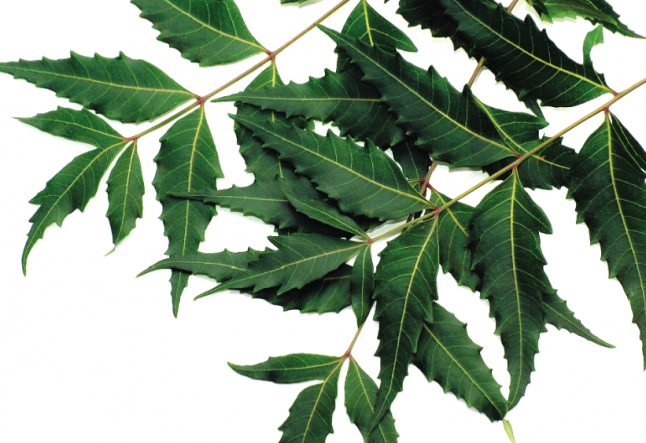 But neem’s contribution goes beyond its effect in skin and body treatments. In a period when precious resources on earth are being exhausted through the use of synthetics as pesticides, the eco-friendliness of neem is a further boost to its reputation as a resilient, well-revered plant that is also a non-toxic and biodegradable pesticide. The delicate balance of preserving the very nature of this earth that sustains us is an arduous task, and neem takes the center stage in its nature to protect our environment. Its significance is further enhanced as organic farming and sustainable agriculture continue to emphasize the use of botanical plants as pesticides. Since it has been transplanted to Africa, the Middle East and South America, neem has thrived in even the poorest of soils because of its ability to extract nutrients from the ground. And since almost every part of the plant is used, its overall efficiency is truly remarkable.